5 day cancellation policy: If cancelled less than 5 days prior to check-in or no-show, you are charged the full remaining balance of your reservation. 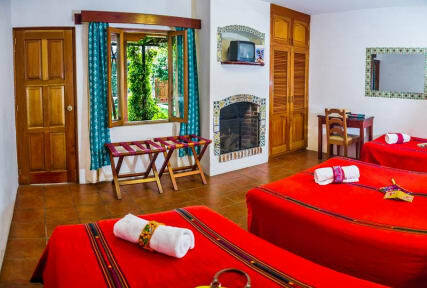 Hotel San Jorge gives you the atmosphere of La Antigua Guatemala’s past. 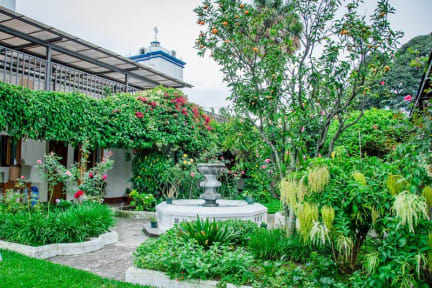 Located on a quiet corner just a few blocks south of Parque Central, Hotel San Jorge is like a country hacienda with a lush and large central garden, hidden behind the famous Spanish colonial walls of La Antigua. Our staff is friendly and helpful and our resident parrot Paco is always on hand to offer you a welcoming, “hola.” The hotel is decorated with local art, woodcarvings and the colorful textiles that help make Guatemala so vibrant and unique. All rooms are on the ground floor and are equipped with modern amenities. Open your window and enjoy a fresh breeze from the colorful tropical garden. For a little added comfort, ask for one of the rooms with a fireplace and a bathtub. Guests who arrive by car will be happy to find there is a secure parking lot adjacent to the hotel. Throughout the hotel you can enjoy comfortable places to rest. Serve yourself a drink from the courtesy coffee station, and choose a place to relax. Sit by the fountain in the beautiful garden and listen to the songbirds as they fly between the rose and hibiscus bushes. Or go upstairs to the rooftop terrace where you can settle into a lounge chair for a siesta while basking in the Central American sun, or sit under the awning and enjoy a spectacular sunset with views of the three volcanoes that surround the Panchoy Valley. The rooftop pergola can also be reserved for special events and conventions. Honestly, all positive things! Very nice experience. They helped us arrange a shuttle to the airport, it was clean, the rooms were nice, location was perfect. Truly happy! Hotel San Jorge was perfectly located in Antigua for excursions into the center of town and also pickup for trips outside. Inside the hotel walls it was very peaceful and someone was around 24/7 to take care of any needs or let you inside. The room was well appointed, comfortable, and there was fresh water available to drink all around the hotel grounds. When it rained, they provided umbrellas. I would definiteley stay here again. We walked into a beautiful garden, with a pretty little bird greeting us everyday. The staff was night and there was coffee available at every hour. The rooms were clean and simple. I really loved the typical art and how quiet the place was. Amazing place if you are looking for a quiet stay at Antigua. The garden is beautiful and the location really good to explore everything you need to see. If you are single, reserve a double room . It’s worth the price. The single room is next to a parking area. Get place to stay for the price. It’s not in the center of everything so it’s nice and quiet. You are able to walk everywhere and get around easily. The staff was very friendly and helpful. Really happy with this hotel. It is in such a great location - literally a 3 minute walk to one of the main parks in the city centre. The staff were very friendly and helpful. The room was so clean, the beds were cosy and the showers were hot. We loved this place and would definitely recommend to anyone wanting somewhere quiet and comfortable to stay. It is located very close to the center of town and everything is within easy walking distance. A very pleasant, relaxed atmosphere due to the garden through the center of the hotel was really nice. The high walls block out a lot of the noise of cars driving by. Security was very good with an outer door that must be opened by staff when you ring the doorbell. The bed was soft and the shower was good. Free coffee and tea throughout the day was definitely a plus as well. Lovely garden, fine rooms. A great place for very little cost. DO NOT STAY HERE. First of all, you have to ring a doorbell in order to get in, and the staff is not prompt. This is very concerning/frustrating, especially late at night since the street is not well lit. Furthermore, there are bugs in the room - a lot of them. I woke up with my entire eye swollen since I was bitten so bad. Upon check out, the staff was completely rude about it, and instead of offering any sort of consolation, instead asked me to pay $1 for a bottle of water I had.